I freely admit it. I am a yarn snob. I usually do not work with acrylic anymore and it's because I just don't like it. My Sit 'N' Knit friends and I are making friendship afghans, basically we're each doing a unique square in each person's color and then we'll put them together and each have a small afghan with nine 12 X 12 squares. We decided on a certain brand of acrylic yarn because it's very available and it's washable and it does soften a little with use and washings. I used to use the stuff when I crocheted a lot, but I was on a tight budget then. Now, I've become a terrible yarn snob and I really just don't like working with it. It hurts my hands and it's incredibly slow even though it's worsted weight. I just don't like it. There, I've said it. I feel better now. Seed beads and Swarovski crystals to play with. (I know, I know, I have enough things to work on.) Not pictured are the pretty white glass pearls that I got for Icarus. I figure you'll see those soon enough. OOO I lve the little boxes! Are they yours or did you order the beads in them? Hmm, those look like they'd be great boxes for special stitchmarkers, too. I guess I'm a yarnsnobb too, because I don't like acrylic eighter. I hate knit with it, right now I love alpacca.And fancy sockyarn, he he. i learned my lesson with crappy yarn. only use acrylic for presents that i know won't be handwashed. 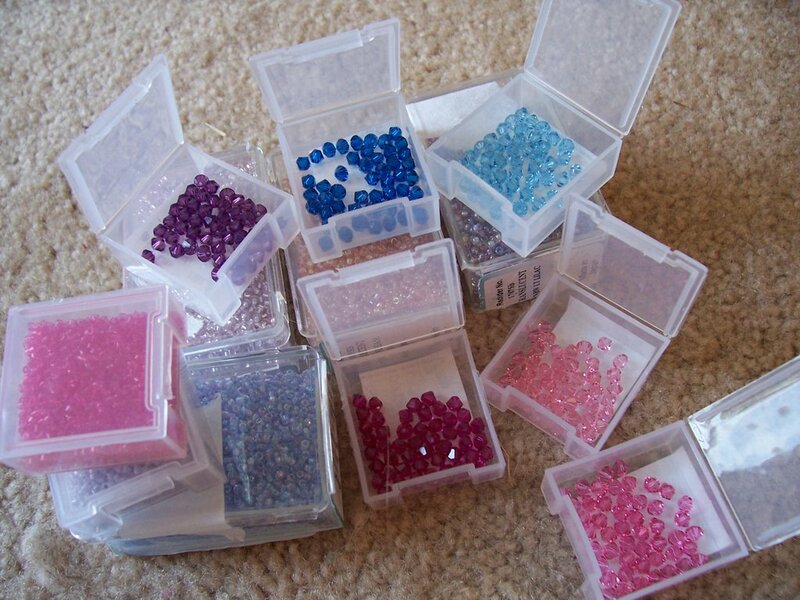 love those tiny bead boxes! did they come in those boxes? oooh, I love beads. Pretty pretty! I don't like ACK!rylic either, though I'm forced to used it for baby stuff, as my family keeps breeding. Acrylic is really good for toys (because of its stiffness actually) but other then that, I avoid it like the plague, so I totally hear you.